A number of significant findings on tuberculosis and HIV surveillance and surveys were presented and discussed at the meeting. Topics included a review of Ethiopia’s HIV program; progress towards the UNAIDS 90-90-90 goals; a review of the country’s tuberculosis program (the WHO’s End TB strategy); and progress on the early waring indicators survey for HIV drug resistance in Ethiopia. Among the important findings, on-time pill pick up as indicator of population-level adherence to antiretroviral therapy showed that only one-fifth of health facilities achieved excellent performance (>90%). The national tuberculosis/HIV sentinel surveillance pilot report was presented. This report was produced from one year of data collected from 42 health facilities around Ethiopia. The HIV screening rate showed some regional variation, ranging from 64.3% to 97.9%. In addition, 85.1% of patients co-infected with HIV and tuberculosis had started or had continued with previously initiated antiretroviral therapy during the course of their tuberculosis treatment. From sentinel surveillance of sexually transmitted infections based on syndromic case reporting, a total of 2965 cases of sexually transmitted infections were reported from 28 sentinel surveillance sites. In addition, more than 25 research findings were presented on HIV, tuberculosis, and sexually transmitted infection programs that had been conducted by local universities and research institutes. 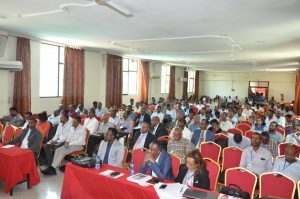 Finally, discussions were undertaken on surveillance of HIV, tuberculosis, and sexually transmitted infections, as well as HIV-tuberculosis co-infection in Ethiopia. “Facility-level coordination of HIV and tuberculosis programs needs to be strengthened for sustainable access to HIV diagnostic testing, antiretroviral treatment, and viral load testing services for hard to reach populations in Ethiopia,” said Dr. Aytenew Ashenafi, Program Manager for laboratory systems at ASLM, at the panel discussion on challenges and the way forward for achieving the ambitious 90-90-90 targets. He went on to emphasize the importance of program ownership and coordination. There was general agreement with these sentiments, although several participants mentioned that funding constraints continue to be a major concern in the HIV response. The panel discussion also brought up that sentinel surveillance of low-level epidemics should concentrate on population sub-groups at higher risk for HIV infection, in order to make the best use of resources. Other key issues of concern, such as data quality, strengthening evidence-based research, and HIV-tuberculosis program ownership, were pointed out and shared by participants. In closing remarks, Dr. Tsegereda Kifle, Deputy Director General of the Ethiopian Public Health Institute, thanked all the participants for their active participation and the fruitful discussions on HIV/AIDS, tuberculosis, and related diseases research findings. as well all those who were involved in the research activities. In addition, she mentioned that the research report would be disseminated to share the information with all the relevant stakeholders to ensure that the findings would have an impact and be translated into practice.